The technician described it as “white with a semi-oval shape on the horizontal axis.” The nine minute video was released by CEFAA – the Chilean government agency which investigates UFO. Keep in mind, this is not the first time that highly trained military professionals have captured something astonishing and unexplainable on radar while in flight. Approximately 10 years ago, the Mexican government released footage of 11 bright objects that were moving rapidly across the sky which were captured by their Air Force pilots. Strangely, these objects were reported to be invisible to the eye, although captured on radar as well as infrared cameras. See picture below. 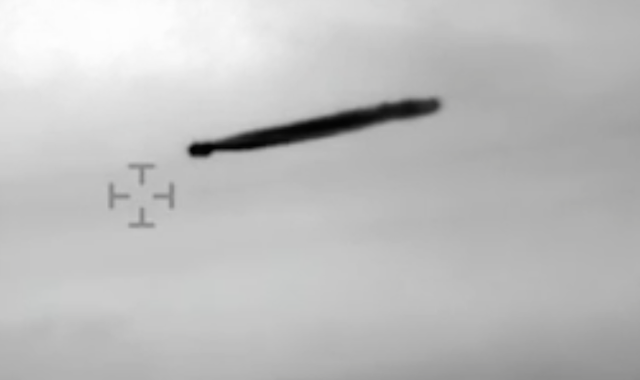 Chile Navy Release 10 Min of UFO Footage In Infrared, Gov Calls It 100% Real, 3 Videos, UFO Sighting Daily. This incredible raw military footage was captured by two naval officers on a military helicopter with a high tech infrared camera with computer target tracking. The footage was taken by Santiago when they were flying at an altitude of 4,500 feet up. They first noticed the UFO with the naked eye when they were 34 to 40 miles away from it. The helicopter pilots were a Navy captain and a camera technician who's specially falls into this area, so with an expert like him behind this high tech military grade IR camera...this UFO was not going to escape from being recorded. They captured ten full minutes of video that is absolutely mind blowing. The captain stated that the UFO was a "flat, elongated structure with two thermal spotlights-like discharges that did not coincide with the axis of motion." During this chase, the pilot contacted two different radar towers, but both were unable to track the UFO the pilot was recording. The pilots helicopter radar also failed to pick up this alien craft, and yet they it was big enough to notice 40 miles away and record for over 10 minutes! The pilot of the helicopter did attempt to contact the UFO with his radio, but there was not reply, probably because alien craft communicate in different ways than our old ancient radio waves. This ground breaking footage realised by the Chile government and their statement of it having been analysed and scrutinised for over 2 years before its release, only adds to the authenticity and importance of this sighting.